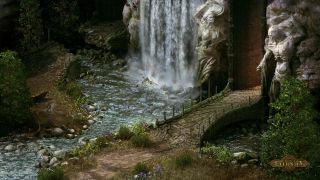 Obsidian has released the first in-game footage for Project Eternity, demonstrating how the engine will feature dynamic elements such as lighting, weather, water and wind in a 2D engine. Those features aren't easy when you're dealing with otherwise static 2D assets, but the wizards at Obsidian have it sorted. Writing on the Obsidian forums , Project Eternity director Josh Sawyer said the team were impressed by what the artists (lead environment artist Hector Espinoza and rendering programmer Michael Edwards) managed to achieve. "While we are still working on refining some of the dyanmic elements, we're very happy with the progress we've been able to make and hope you feel the same way," Sawyer wrote. If watching that video isn't enough, why not read (or re-read) this interview with Chris Avellone where he reveals how the team is progressing with the project. He also makes a good case for why the studio opted for the 2.5D perspective in this brave new 3D-obsessed world.